I`m selling this unique black CLASH shirt along with jackson pollock style tie. 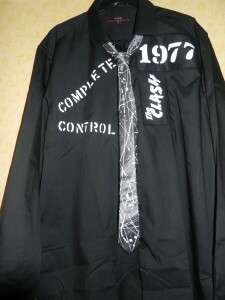 Shirt has `Complete control` stencilled on right chest with a clash and 1977 patches sewn on left chest,tie is hand painted. This is a new shirt with nice rounded collar which is a size xl 17" collar 65% polyester 35% cotton.